Do Team Fortress 2, only set it in the Wild West. Looks simple on paper, but is it really that easy to copy Valve's successful formula for multiplayer shooters? 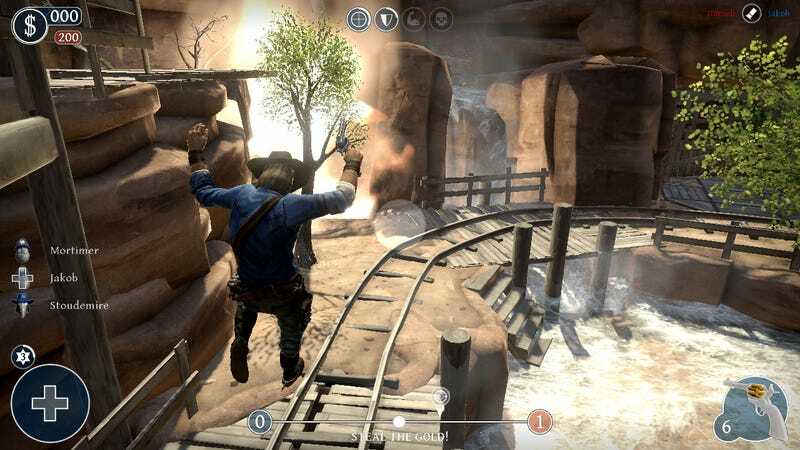 Lead & Gold: Gangs of the Wild West is a team-based online shooter, where you can play as either the red or blue side, and then take on your opponents in a variety of objective-based levels across a bunch of different of maps. You can choose from different classes, each with different weapons and abilities, and the game has a clean, stylised look to it. So far, so Team Fortress 2. The thing is, looks are about where the similarities end. And for Lead & Gold, this is a problem. Nice Duds: Lead & Gold looks great. The classes are easily distinguished, fit Western stereotypes without looking clichéd, there's a consistent and effective style to the world and the lighting effects on the maps bring an unexpected level of polish to the game's visuals. Maps: For a multiplayer shooter, map design is crucial. And despite being the product of a relatively small team, Lead & Gold has a great variety of maps, each unique and each featuring memorable choke-points and room for flanking. The ones where long-range combat are emphasised are particularly well designed. Good Ideas: Lead & Gold knows the little tweaks and features that have worked in other recent shooters, and isn't afraid to hand-pick some of the best of them. These range from roaming spawn points (Battlefield) to the "not quite gone" mechanic of leaving a near-death player on the ground with the use of their pistol (Left 4 Dead). After all, good game design can often be as much about knowing what to borrow as what to invent. Lag: Hoo boy. Lead & Gold's network code is bad. Really bad. I can't remember the last online shooter I played that was so crippled by it. I'd estimate around half the games I played I ended up quitting because the host was lost or the game bogged down into a ghost chase. Making things worse is the fact the game lacks dedicated server support, meaning you can't get around this if you tried. Nobody's Home: I didn't just have problems playing games. I had problems finding them. Since the game's launch barely has the global online playerbase numbered over 100, and most times has been sitting at around the 40-60 mark. This means you've often only got 1-2 games to choose from, and in some cases, no games at all. Loose Goose: Aside from the Trapper's scoped rifle, most weapons in the game feel very loose, making precise aiming difficult. I know this may be realistic for the time, but it's also not much fun. Same goes for Lead & Gold's collision detection, which is a bit skittish, making jumps and the navigation of tight spaces a bit tougher – and slower - than it should be. Silence: Lead & Gold does not, at this time, support dedicated voice chat. So you're going to have to come up with a workaround. While for some game modes this won't really matter, for others – the ones that require teamwork to accomplish complex objectives – it's sorely missed. For a small team, on what is obviously a small budget, Lead & Gold is an admirable attempt, and one that, on the times it all came together, I had a lot of fun playing. With its current litany of technical woes, though, I can't really recommend people give up playing something like Team Fortress 2 for it. It's just too rough and lacking in features that in 2010 gamers rightly take for granted, even when you consider its generous price ($15). Now for the upside: the upcoming PS3 and Xbox 360 releases will hopefully address most of those concerns (as could promised updates to the PC edition)! Lead & Gold was developed by Fatshark and published by Paradox Interactive for the PC (version reviewed), PlayStation 3 and Xbox 360. Released on April 9 for PC, April 22 on PSN (PAL), Xbox 360 & PSN (NTSC) TBA. Retails for $15. A copy of the game was given to us by the publisher for review purposes. Played all maps and game modes using all characters.